The CSTM Team welcomes you to our website! THERE ARE HOMES THAT TIME SHOULD NOT CHANGE... AND THERE ARE HOMES WHERE THERE NEEDS TO BE CHANGE. It is our hope that you will let CSTM CORP do your job right one time, for a lifetime. CSTM Corp is owned and operated by Kurt Catalano. Kurt has been working on landmark and non-landmark properties in the Greater Rochester area for almost 25 years. The craftsmen at CSTM are quality driven and strive to exceed the expectations of their valued customers. Their work is not just a “job” it is their passion. 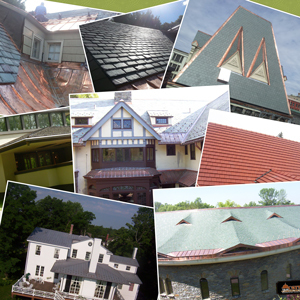 CSTM Corp's services range from copper accents to total roof replacement. From a small roof to over 100 square roof, no detail is overlooked. 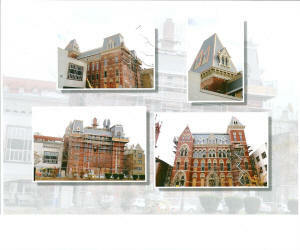 We have worked on Churches and historical buildings in the tri-county area alongside Architects and General Contractors. We have done several complete roof systems. Kurt Catalano of CSTM Corp recognized with the Craftsman of the Year award. On November 14, 2010, the Landmark Society of Western New York, Inc. awarded Kurt for his exceptional craftsmanship, knowledge of historic design, and his outstanding contribution to historic preservation through his work as a roofing specialist and contractor in Western New York. Through this award Kurt is credited for his precise and exacting standards, while performing a vitally important service appreciated by his clients. Historic Preservation Award: CSTM Corp, who did the slate work, copper work, and flat roof work, is proud to announce that the Academy Building in Rochester, New York, is one of 6 recipients of a New York State Preservation Award. Copyright © 2015 CSTM Corp. All Rights Reserved.